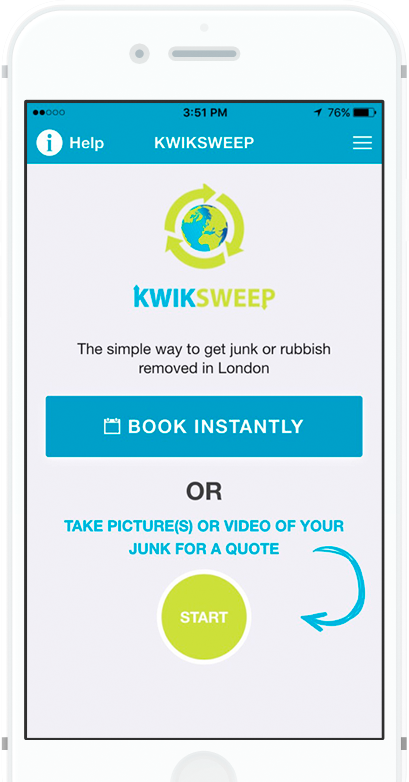 Get rid of your junk or rubbish fast with the new mobile app from Kwiksweep, on Android or IOS. Take a picture(s) or video of your junk for an instant quote. Then choose a collection time, confirm your location, and pay using your credit or debit card - all via the app. Don’t require a quote? You can check our pricing guide and make an instant booking. We will turn up and give you the exact price at the point of collection. Get junk cleared with the touch of a button. Take picture(s) or video of your junk. 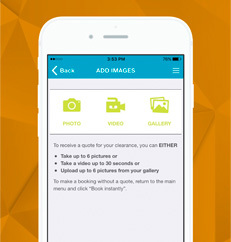 To receive an accurate quote, the app allows you to capture images or videos of your junk at the touch of a button. If you don’t require a quote, make an instant booking for a date and time that suits you. 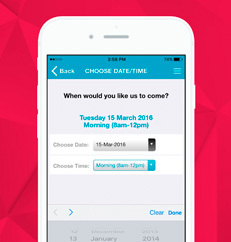 Book a time and date that suits you. Make an instant booking for a time and date that suits you. Our friendly uniformed team will call you an hour before we arrive. 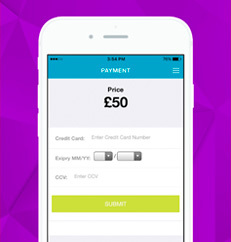 Pay safely and securely via our simply app. Then sit back and let us do all the lifting, loading and clearing for you.